BigCommerce is able to diversify itself as it strives to serve over 50,000 stores in over 65 different nations. For those looking to start over, diversify, or simply get in while the getting’s good, BigCommerce is the perfect e-commerce solution to help your small business succeed. With billion dollar aspirations, BigCommerce is on its way to becoming an e-commerce powerhouse enabler and as such has tried to make things as simple as possible for entrepreneurs who are seeking to carve out their own business online. The biggest unique selling point for BigCommerce is that it is based on a software-as-a-service (SaaS) model. This means that the provided service is one of the easiest to navigate in the e-commerce world. 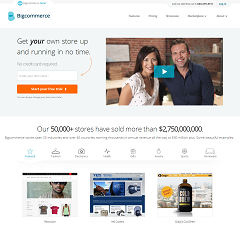 The founders of BigCommerce have designed the software with ease and simplicity in mind. The interface is said to be one of the easiest to customize and monitor in the industry. This is really clutch because although many business owners are turning to opening stores online, it does not mean that all entrepreneurs are all technologically savvy. Simple is better, especially in the case of e-commerce software as it allows BigCommerce to reach and appeal to a larger pool of small business owners. On top of its user-friendly interface, BigCommerce provides unique marketing services that help the company stand apart in the industry. After surveying and studying the e-commerce market, the founders of BigCommerce realized that what many small business owners wanted was a better way to drive demand to their online stores. As a result, the company made it one of their top initiatives to really invest in the type of marketing that comes with the service. 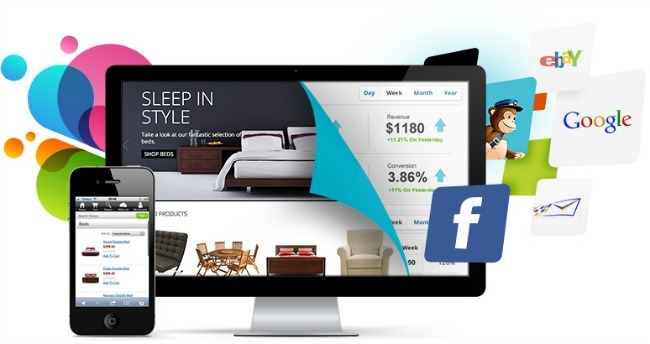 With BigCommerce, marketing options for users include connection to email marketing platforms, eBay integration and connection to Facebook, to name a few. The BigCommerce team knows that small business owners do not have time or a huge budget to hire a marketing agency. BigCommerce is convenient because some of the key marketing tools needed to generate traction for a business are built right into the platform. The founders of BigCommerce frown upon the notion that if you build it, they will come. The company knows that that is not a realistic way to grow a business, especially online. That’s why a unique selling point for the service is that getting your site live is not an end point, but rather a milestone that needs to turn into driving traffic to the site so you can start to see some sales. 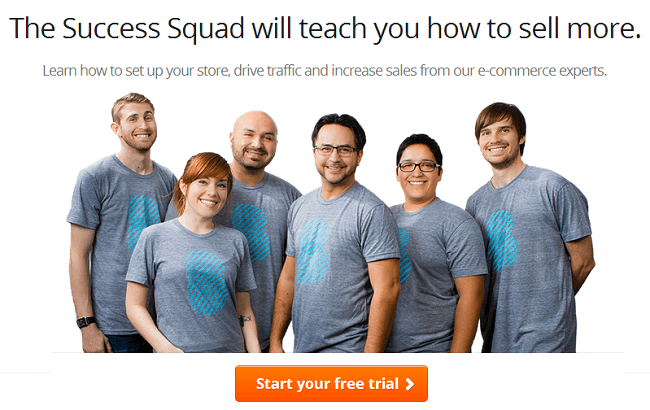 A way to help business owners, BigCommerce offers what it calls the Success Squad. This is a service to teach users how to use the platform’s marketing tools to grow his/her business. In addition, the Success Squad helps teach the importance of managing inventory, how to follow up with clients and keeps users up-to-date on the latest trends in the industry. In order to reach their global audience, the Squad hosts regular webinars that are free to join with any membership. Through the Success Squad, the company also conducts studies and analyzes the market place. 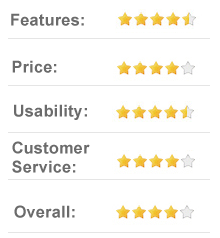 It then shares these results with its users so that they can better improve their online selling strategies. Most recently, after analyzing data provided by 50,000 of its own clients for the past year, BigCommerce determined that auto, jewelry, toys and games and pet care are fast-growing areas where one-of-a-kind merchants are outperforming their big-box or chain store peers. A unique feature, these extensive studies are shared with users, regardless of membership level. The product exists in many options with the levels appropriately named: Silver, Gold and Platinum. The Silver service costs as low as $34.95 per month while the Platinum service, with a sloo of features, is on the higher end at $199.95 per month. Depending on the product level selected, one will receive a wavering level of service. Naturally, the more one spends the more services and features that will be available to the business at hand. The company offers a free 30-day trial in order for small business owners to get a feel for the system to see if it will help fulfill the entrepreneur’s needs. BigCommerce also offers a unique plan called the Enterprise Plan. This plan is perfect for the business owner who has high bandwidth demands, high volume API calls and/or multiple stores and priority support needs. 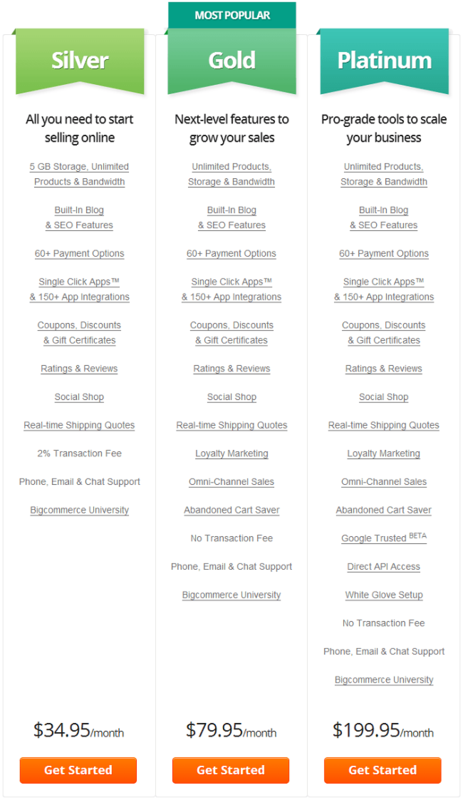 Prices vary for the Enterprise Plan and as such a quote must be received from the BigCommerce team. With the majority of feedback on BigCommerce has been positive, nothing is perfect and as such there are some widespread criticisms of the service. The first major criticism is that the price for the starter plan is a little on the high end compared to other e-commerce services in the industry. It would be helpful if there was a slightly cheaper plan for business owner with a small number of products to sell. Another criticism by many users of the service is that although the service is simple and easy to use, the website templates that the service provides are not as nicely designed as other key competitors in the space. Many of the templates are simple and somewhat bland and boring looking. This will hopefully improve as the service continues to expand its user-base and receives more concrete feedback. Lastly, BigCommerce does not come with a blog as a standard. Although, it provides other strong marketing features, it seems to be missing a bogging service. Blogging is simply one of the best ways to drive traffic to a website and by omitting a blog from its features, BigCommerce has missed out on an easy-to-operate marketing opportunity. It can be complex and sometimes confusing when creating a website for your business for the first time. Since creating a website isn’t necessarily a business owner’s main expertise, it’s nice to know that there are other representatives who are able to lend support in a time of need. That’s why BigCommerce offers support via telephone and e-mail for its customers. Members who use the service are able to reach out through these vehicles should they have any questions, need advice or support on the proper way to develop their site. BigCommerce also offers extended customer support hours to its users. Although customer service is not provided around the clock, business owners can reach them 24 hours a day from Monday through Friday, and most of the time over weekends. There are many e-commerce services that exist to help small business owners get off their feet, but BigCommerce is the better choice that can really help leave a lasting online footprint for one’s small business. The service stands apart in an industry that is quickly starting to become cluttered. It has received high acclaim and praise from many entrepreneurs who have used the service. Above all else, it is incredibly easy to use and this combined with the excellent marketing functionalities are what really helps it break through the clutter. Simply put, BigCommerce is truly a top choice for any entrepreneur or small business owner looking to run a business on the Internet.